GreenPartStore has a huge selection of John Deere farm equipment parts, including the full range of parts, accessories, and more. We have everything you need to repair, maintain, and customize your John Deere vehicle. In fact, we have access to far more parts than we can list on our website. If you need a part you can't find in our store, please call our toll-free phone line at 888-432-6319. 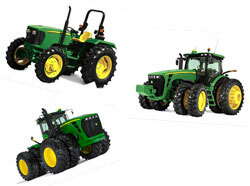 We have John Deere Row-Crop Tractor parts, John Deere 4 Wheel Drive Tractor parts, and much more. Our part inventory includes every John Deere model and is organized by model number so you can find your needed parts conveniently. If you have your part number already, you can also search for it directly by entering it into the search box above.